At the risk of being both evasive and obvious, let me open by saying that this book is about many things. It is about the artist Sherrie Levine, of course, but that means, given the insistent referentiality of her work, it is also about Walker Evans and Edward Weston, Marcel Duchamp and Constantin Brancusi, Gerrit Rietveld and Donald Judd, Alfred Stieglitz and Georgia O'Keeffe. Thus, in these pages I will spend as much time moving away from Sherrie Levine, following her leads, as moving toward her. Levine's references and appropriations look back to the first two or three decades of the twentieth century, but her work is decidedly staged in the present, inevitably engaging this book in various factions, histories, and theories in and of the art world and the university since the late 1970s. And therefore, there are still more names: Valentin Tatransky, Douglas Crimp, Craig Owens, Rosalind Krauss, Thomas Lawson-Levine's earliest critics, to whom I remain indebted-and the names they bring with them: Walter Benjamin, Sigmund Freud, Jacques Lacan, Gilles Deleuze and Félix Guattari, Michael Fried, Roland Barthes. And then there are the artists whose work Levine's has been seen with or posed against over the past three decades: Jack Goldstein, Robert Longo, Louise Lawler, Barbara Kruger, David Salle, Cindy Sherman, Mike Bidlo. Levine's work refers, it needs other names to be spoken, and in this, its aspiration, so to speak, is quite different from that of the modernist work that Clement Greenberg famously described as "given, increate, independent of meanings, similars, or originals." Levine's work pursues meanings and similarities: its structuring terms are those of the original and the copy (if we assume these identities are settled) or the double or simulacrum (if, in some sense, their order is unsettled). It relies on such categories as identity and difference, before and after, the specific and the general-terms and oppositions that might produce yet another list, a pantheon of philosophers: Plato, Kant, Nietzsche, Kierkegaard, Heidegger, and so on. Although I do not approach these philosophers, I rely on the modern discourses that have taken up their terms and the questions they posed: in anthropology, linguistics, psychoanalysis, and a variety of philosophies, from aesthetics to analytic philosophy, to the philosophy of history or of narrative. This book could have been written and rewritten numerous times-each time through another set of texts, another set of descriptions of what one thing has to do with another: Marx, Freud, Lacan, Saussure, Derrida, Deleuze. Their descriptions of relations, of substitutions, of standing for, or with, or against, seem perfect at moments to describe the varieties and the specifics of Levine's work. My argument is not that that Levine is illustrating theory-as the accusation goes-but that she is positing it. the whole history of the concept of structure ... must be thought of as a series of substitutions of center for center, as a linked chain of determinations of the center. Successively, and in a regulated fashion, the center receives different forms or names. The history of metaphysics, like the history of the West, is the history of these metaphors and metonymies.... all the names related to fundamentals, to principles, or to the center ... eidos, arch?, telos, energeia, ousia (essence, existence, substance, subject)[,] al?theia, transcendentality, consciousness, or conscience, God, man, and so forth. Despite the thickness of the language, there is in Peirce and Derrida-and perhaps in my too quick slide from one to the other-a marked fluidity in the signifying, substituting process: one circulating, ungrounded sign exchanged for another, for many others, in a decentered system. The lesson of Freud, or of Claude Lévi-Strauss's structural anthropology-it is his structure that Derrida is writing to here-is that the center is felt, and indeed present and causal, in its absence. And that the objects we substitute for it have their own heft and sticky slowness. These are the objects that Levine deals in. It is just the account of an obscure life, that of a poor country girl, pious but fervent, discreetly loyal, and tender as new-baked bread. She loves one after the other a man, her mistress's children, a nephew of hers, an old man whom she nurses, and her parrot. When the parrot dies she has it stuffed, and when she herself comes to die she confuses the parrot with the Holy Ghost. This is not at all ironical as you may suppose, but on the contrary very serious and very sad. I want to move tender hearts to pity and tears, for I am tender hearted myself. "A fetish is a story masquerading as an object," writes the psychoanalyst Robert Stoller. One could use the fetish as a model for a relationship of language and object, an interpretive model that might have lessons for the practice of art history, which, after all, wants to put language in some relation to objects-to read them as symptoms, perhaps, or as patterns of intention, as Michael Baxandall had it. I spend some time in the first two chapters of this book talking about fetishism, particularly in chapter 2, in which I recognize Freud's scenario of fetishism-the scene he sets up to explain its substitutions-in my own encounter with Levine's now-infamous photographs after the Depression-era photographs of Walker Evans. But the fetish is only one model I have found useful for the relationship of story and object in Levine's work; given its incessant referencing, the work masquerades as any number of stories, many of them with theoretical or historical sources. Given her attention to the objects of art history, one could take Levine's work as an experiment in art historical interpretation, suggesting that it might have something to say about that history, perhaps, rather than simply being one of its objects. And in chapter 5, I argue (using Baxandall, among others) that Levine's work pictures the work of art as already the object of art history, doubled in and threaded through with language-as what a theorist might call a theoretical object. I close chapter 3 by invoking Roland Barthes's term "simulacrum" (rather than Jean Baudrillard's now more familiar one), his term for the object that structuralism at once analyzes and produces through its analysis as "intellect added to the object," a reconstruction of the object that reveals its functions and its system. I draw there too on the philosopher Frank Ankersmit's discussions of "narrative substance," a term from the critical philosophy of history that, in a sense, works the other way, describing not the object under language, but language as it becomes objectlike, the thick and nearly substantial discursive substance that forms around and is stood for by specific terms and names, the sorts of names that build up around Levine's work. These terms, too, are substitutions-fetishes, one might say-and they do a certain kind of work in excess of their denotations. Reading Levine's work as an interpretive project intensifies the difference between it and its sources, a difference that is at once historical and gendered; her redescriptions inscribe both afterness and otherness. Such a reading also demands that I explore material differences within her own practice. While Levine's work is often reduced to a procedure or a name-appropriation-and dismissed as a version of the readymade, a conceptual project at best, there is matter to attend to: there is a material and signifying difference between photographing photographs and realizing in three dimensions a work originally existing in two, one that opens out to histories and theories of medium and genre. Indeed, as is clear from the table of contents, this book is organized in part by medium, or, it must be said, by how certain traditional media are both necessary to and troubled by her practice. The central chapters address, in turn, Levine's photographs, her paintings, and her sculptures, precisely as these different practices are practices within and about-or in curious ways, without-those media and their physical and conventional relations to her terms: to the copy, the detail, repetition, and so on. I will turn repeatedly to the object-to that which an "object-based art history" wants us to pursue-but with a clear awareness of how strange Levine's objects are, how dependent they are on discourse, or how insistently discourse is embedded in them, or masquerades as them. Given that I have already, even over these few pages, written of her work as an art of substitutions, of copies and fetishes, and have characterized her as an interpreter, a commentator, or historian, I am not altogether sure how to start at the beginning with Levine, since her work never does. Writing an introduction for her is difficult, since it always seems to require deferring her and introducing someone else. Still, some sort of preface might be just what is called for; particulary as Derrida has written of it, prefaces-and introductions and forewords-are marked by temporal ambiguity, a stuttering from the very outset. "The preface would announce in the future tense ('this is what you are going to read') the conceptual content or significance ... of what will already have been written. And thus sufficiently read to be gathered up in its semantic tenor and posed in advance. From the viewpoint of the fore-word, which recreates an intention-to-say after the fact, the text exists as something written-a past-which, under the false appearance of a present, a hidden omnipotent author (in full mastery of his product) is presenting to his reader as his future." Both a summary and a guide, the preface at once precedes the text and follows it as its curious double; indeed, one might take Levine, then, not only as a reader, but also, and necessarily, as a writer of prefaces. "Here is what I wrote, then read, and what I am writing that you are going to read. After which you will again be able to take possession of this preface which in sum you have not yet begun to read, even though, once having read it, you will have already anticipated everything that follows.... because in pointing out a single thematic nucleus or a single guiding thesis, it would cancel out the textual displacement that is at work 'here.'" Derrida's discussion of the spatial and temporal slippage of the preface seems a particularly appropriate way to introduce Levine's work, then, since to talk about her work it is necessary to start in the middle: there is always already another term present, the "before" that she appropriates-Walker Evans, Edward Weston, and so on-that always comes before her "after," but that was not a "before" before her taking, not yet caught up in such a sequence, and so only becomes a "before" after. This discussion of the temporality of the preface seems fitting also as it insists on the reader's knowledge going in: you, too, are always situated in the middle of her transaction; she and I both rely on you to know the names of her firsts-Evans, Weston, Duchamp-in order that they can be put in play. And still, there is the more familiar work of the introduction to do. Chapter 1 continues this discussion of the difficulty of beginning with Levine, both because of the work's indebtedness to other work and because for some writers on her work it was over-obvious and settled-nearly before it began, reduced to its concept, perhaps, or its politics, at once fully represented and nearly effaced by the criticism that has accompanied it from its very first moments. While the chapter begins at the beginning, so to speak, with Levine's earliest works in New York and the 1977 exhibition "Pictures," curated by Douglas Crimp and shown at Artists Space in New York, it insists on doubling and doubting that origin, reading the difference between the two debuts of "Pictures"-first the 1977 exhibition and its catalogue, and then Crimp's far better known and more widely circulated 1979 essay of the same title in October-in relation to her developing practice. The term "postmodernism"-a term that has its own "before and after" problem, since it seems in our present moment that we are after it once again-didn't appear in Crimp's essay in the 1977 exhibition catalogue, which situated the work of "Pictures" within one branch of a "tradition of modernism," and I spend some time tracing the development of the term as it emerged in the pages of October at the end of the 1970s. The argument for Levine's postmodernism is familiar, and perhaps settled, but it emerged alongside other, more local and unfamiliar readings. So I lean heavily on a short 1979 piece by Valentin Tatransky in the first issue of Real Life, a small, artist-founded magazine, which offers other terms with which to think about Levine's work, terms that prove fruitful over the subsequent chapters: melodrama and collage. Chapter 2 begins again with Levine's photographs after Walker Evans and Edward Weston and the discourse of what Crimp termed "the photographic activity of postmodernism" as it appeared in October. It situates Levine's material practice of rephotography within a discussion of the rise of the market in fine art and vintage photography in New York in the mid- to late 1970s, a discussion that took place not only in October, critically, but in the pages of the New York Times and Artnews. One can, I think, tie the rephotographs rather precisely to the art historical rediscovery of photography in that decade, and explain their critique of the traditional concepts of the original and the authentic in relation to the way in which those terms circulated in the market and in art historical texts to revalue photographs-works that are almost always multiples and, as prints from a negative, curiously without originals. But that history, I argue, however apt, does not explain the effect of her appropriations and how odd they are to see. At its center, the chapter turns on my own first encounter with Levine's After Walker Evans photographs, in the Richard Kuhlenschmidt gallery in Los Angeles in 1983, one I recorded at the time in a review in Artforum. This chapter rereads that encounter in relation first to an old art historical distinction between explanation and interpretation and then, more insistently, to Freud's essay on fetishism-on not being able to look at, to acknowledge, what one sees. Precisely because they are the same as Evans's photographs, Levine's copies trouble the relationship between vision and knowledge around the question of sexual difference: What does it mean, I ask, to take these images as Levine's, or for that matter as Evans's? What readings are engendered? In monographs on Evans-and in histories of photography in general-documentary photography's division between the photographing subject and the pictured object is insistently described in gendered terms. Levine's copy collapses those poles, creating a closeness that I address through feminist psychoanalytic discussions of fetishism and masquerade. Chapter 3 takes up again the history I began to recount in chapter 1, examining Levine's move from photography to painting by 1984, and her appearance in New York's East Village-first, in 1984, at the gallery Nature Morte with watercolors after Egon Schiele and Kasimir Malevich and paintings after Malevich and Ilya Chasnik, and then, in 1986, on a panel at the Pat Hearn Gallery-where she was seen by a different, more local set of critics and with a different group of artists, specifically painters such as Mike Bidlo and Philip Taaffe. This linkage was noted in the pages of the Village Voice in 1984-"Sherrie Levine, Mike Bidlo, and Philip Taaffe are doomed to travel through life together in all the same magazine articles, since they all make exact copies of other artists' work"-but clearly is no longer so familiar. Writing both with and against it, I take up the work of Levine's painting, arguing that when she copies directly, it is not from painting, and that her paintings-even when they are after Malevich or Chasnik-are not exact copies, as the Voice had it, or even copies at all. I take this slippage in her work as a question addressed to medium and the modernist idea of "medium specificity"-however alien that idea might seem in relation to Levine's work. Chapter 3 turns on just that question in regard to painting, a medium that, as the aesthetician Nelson Goodman has noted, is most resistant to the copy and the multiple, to repetition and extension. I argue that the conditions under which Levine's rephotographs and her recast sculptures are "taken" are already given in their medium-in their materiality and their conventions-and that painting's resistance to that taking is figured in her work in and on paint, or about painting. These stuttering prepositions are important, as they suggest a difficulty in figuring out how Levine's paintings are paintings; whether their relationship to painting and its modern tradition is ironic or critical or filial. There is an insistent noncoincidence between image and ground in her paintings that seems to inscribe that difficulty; I link that noncoincidence, a ground too big or too small for its image, once again to collage, taken here as a theory of painting after photography. Chapter 4, too, is a history, or a couple of them. It begins where chapter 3 ends, with a 1987 painting, one of a series of chess- or checkerboards in casein on lead that Levine entitled Lead Checks. The first history the chapter traces is of the chessboard, which I take, with the art historians Hubert Damisch and David Joselit, from the wall on Duchamp's studio, where it appears in a photograph taken in 1917 or 1918, back through a brief history of chess and perspective and forward again to Duchamp in America and a chess match, of sorts, with Alfred Stieglitz. It is only a metaphorical chess match, of course, a series of positions taken on art, photography, and dada in New York between 1915 and 1925, the year Duchamp first competed in the French national chess championship. It is through the chessboard, then, but also through her own research into a history of the first American modernism-her work after Man Ray, Francis Picabia, Stieglitz, and O'Keeffe, all positions in Duchamp's match-that Levine enters the chapter. For the first half of the chapter, the board is the "strategic model," as Damisch puts it, for the relations between artists and practices in a bounded art world; it is replaced in the second half by Pierre Bourdieu's map of the "field of cultural production." Levine's Lead Check paintings were first exhibited in 1987 at Mary Boone Gallery in New York, a gallery that had been strongly identified through the first half of the 1980s with the return to painting and international neo-expressionism. Only one woman (Elaine Lustig Cohen) had been given a solo exhibition at the gallery before Levine and Barbara Kruger showed there in the 1980. The dealer herself had been publicly dismissive of feminism, and the politics of feminism in the art world. None of these facts were lost on the writers and interviewers who addressed Levine and Kruger and their exhibitions in the press, from Flash Art and Artnews to the New York Times and the Village Voice. Levine's chessboard was read, even at the time, as a marker of her repositioning, of her making a move, and suggests a critical reinscription in the work itself of the politics of theory and the positions of feminism in the 1980s art world. Chapter 5 addresses the question of what it might mean to take Levine as an art historian, and what the implications might be of imagining that the questions she poses are posed to those of us in the discipline. It begins where we as art historians do most of our work, in front of a classroom, naming a projected image-and it notes the likeness of such phrases as "this is a work by Sherrie Levine" to the act of designating and the logic of the readymade. Taking Levine as an art historian means that I spend considerable time discussing her research on artists such as the Romanian-French sculptor Constantin Brancusi and the Dutch architect and designer Gerrit Rietveld, as their works both invite and are tripped up by her questions about repetition, the false start, and the double. Levine's remakings of Brancusi's Newborn and Rietveld's Berlin chairs and end tables are calculated and specific; her repetitions follow implications and invitations always already embedded, if unacknowledged, in the original. The chapter addresses as well the interpretive effects of the material difference between Levine's rephotographs and her sculptures. It argues that the "after" of After Walker Evans does not take place in the same time as the "after" of her Newborns. The time of the rephotographs is particularly thin: it is that of Duchamp's "infra thin" and the before and after of the photographic moment. In contrast, Levine's sculptures elongate the time between model and copy, giving it the thickness of historical representation; it is here, in reference to her cast glass after Brancusis and her steel Rietvelds-works that weld a history of reception to the original-that the term "narrative substance" comes into play. The final chapter, chapter 6, returns again to the question of substitutions and replacement objects. It takes as its starting point the question of counting: whether Levine's works, even when they are exhibited one at a time-this rephotograph, that sculpture-are ever singular, given their dependence on yet another image or another work; and if they are more than one, whether they are endless, infinitely reproducible, which is the way they were first written of as models of a photographic postmodernism, or whether, on the contrary, they are always held in the Oedipal opposition of one against one, Levine against Evans or Weston or Brancusi. This question of counting allows me to turn to one final set of works by Levine, her work in pairs: the doubled cast-glass wine bottles (one black, one white), for example, or the set of cast bronze and crystal gnomes entitled Avant-Garde and Kitsch. I lean heavily, too, on another set of gnomes in bronze and black glass entitled, after Deleuze, Repetition and Difference, and use her opening to Deleuze to pose these pairs not just as agonic, narrative oppositions-an opposition I read not only with Freud, but with Lacan and Alexandre Kojève as the struggle for recognition-but as temporary and provisional crossings of series and networks and histories. Or, to return again to fetishes and substitutes, the question the pairs pose is whether the substitute object substitutes for something that was-something that is missing-or whether it is itself a production, something that generates, and that, in the case of this book, continues to generate writing. I have probably said enough about substitutions and copies and redescriptions, and about the difficulty of starting. Here, before I finish this beginning, let me say that one thing that is redescribed and replaced nearly continuously in the coming pages is Sherrie Levine. This is not an exposé or a biography. I have no particular special knowledge of Levine, and there are in the coming pages no particular revelations or causes. After I had given a lecture, a version of which is now chapter 3, an art historian suggested to me over dinner that what is interesting about Levine's work is that it is clearly a mask, that it is obviously hiding something-some trauma or event. For her, perhaps, this book will be, disappointingly, still more masking, the creation of still further fictions and copies-in part because that is the nature of writing, even of the autobiography, and in part, too, because Levine, as a very different kind of author, has worked to actively displace and keep fluid questions of permanence and prior meaning, and to foreground reading and interpretation. Finally, the theoretical models that I (and, indeed, many others) have had recourse to in relation to her work-from Joan Riviere's feminine masquerade to Gilles Deleuze's masks-seem to insist on both the presence and the precession of masking, copying, covering over, doubling, but over nothing, only over other masks. My teacher Mieke Bal wrote a book on "Rembrandt," an artist whose name she kept in quotes over its four-hundred-some pages, to insist on the subject of her interpretation as a "cultural text": "In this study, the name of the author is meant as a shorthand for this complex of readings of certain works as works by a particular artist. In order to keep in mind this definition of the author, I shall put the name 'Rembrandt' in quotation marks, as the title of a text, whenever I am using the name in my own argument. I shall avoid using quotation marks when I render the views of others, lest using them would distort these views." Levine has always already installed her own quotation marks, one could say, which makes my task, and my punctuation, more streamlined. But if this book is in some absolute way not about Sherrie Levine, it is, I guess also absolutely, about me. For those thanked in the acknowledgments, beginning with the artist herself, this is probably obvious, since I have been at work on it in one way or another since the early 1990s. Levine's work has been central to my thinking about art, its institutions, and its professional field since even before that, and it has long been one of the frames though which I have read and tested theory and method. My long-term thinking on Levine's work has played a role not only in my various journal and catalogue essays on her-which account for a significant portion of my published work-but also in my writing on other artists, and in my more broadly sociological writings on the university training of artists and the art school in the present art world. I consider Sherrie Levine a friend. She has supported this project and has commented on parts of it to me in earlier forms and drafts, but she has never asked for changes. At the same time, she has told me relatively little about her biography or her specific intentions for particular works, and I have not asked her for those answers. Again, there are no revelations; there were very few interviews, whether about the meanings and motivations of her work, or about her childhood or her partners, and so on. I'd like to imagine friendship as an ethical relationship, marked in certain senses by refusal, a nonintervention on both our parts. Which is not to say that she has not tried to insist on certain meanings that I have probably failed to track down far enough or to foreground. There is probably not enough on pleasure and sexuality in these readings for her, and perhaps too great an insistence on the encoding of ambition, and far too much on Bourdieu. There are other things, other theorists, positions, and interpretations, that, although this book is about many things, some might find missing or underrepresented. Feminist readings and feminist politics in the art world undergird much of this writing, but, still, there could be more; there isn't a single whole chapter devoted to either a specifically feminist reading of the work or a particular history of the coming of feminism to the New York art world, or to the generation of artists to which Levine belongs. Nor is there much Baudrillard at all, which, as I write, also seems odd, since his theory of the simulacrum was central to the discourse of the art world in the mid-1980s; 1987, the year that marked the end of the 1980s, marked the apotheosis and end of Baudrillard as well. Perhaps in both his case and that of feminism, such readings of Levine's work are too familiar; they have already been fully understood. And full understanding is something I have tried actively to write against. This book examines the career of New York-based artist Sherrie Levine, whose 1981 series of photographs “after Walker Evans”—taken not from life but from Evans’s famous depression-era documents of rural Alabama—became central examples in theorizing postmodernism in the visual arts in the 1980s. 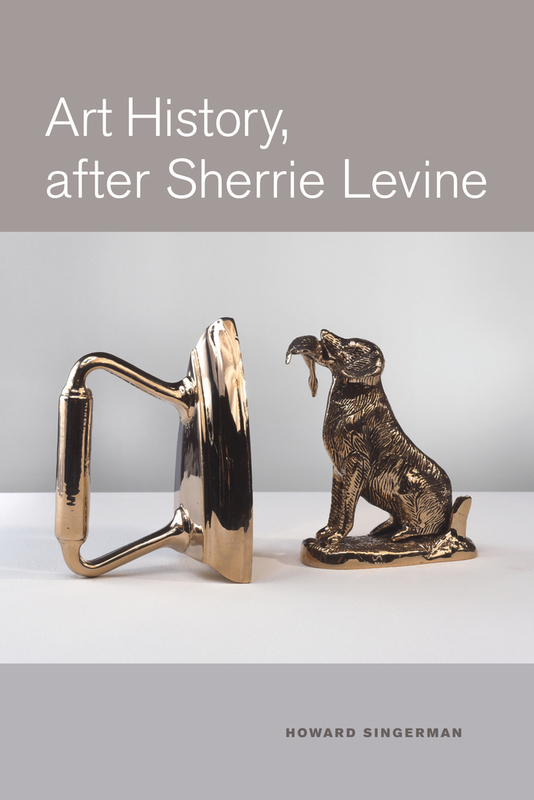 For the first in-depth examination of Levine, Howard Singerman surveys a wide variety of sources, both historical and theoretical, to assess an artist whose work was understood from the outset to challenge both the label “artist” and the idea of oeuvre—and who has over the past three decades crafted a significant oeuvre of her own. Singerman addresses Levine’s work after Evans, Brancusi, Malevich, and others as an experimental art historical practice—material reenactments of the way the work of art history is always doubled in and structured by language, and of the ways the art itself resists. Howard Singerman is Professor of Contemporary Art and Theory at the University of Virginia and is the author of Art Subjects: Making Artists in the American University (UC Press).